The purpose of this photography guide is to present information for photographers visiting Mt. Rainier NP and want to have some ideas and information about the area to better plan their trip and photo locations. Each of the five areas have specific information and locations for that area along with some general information and resources applicable to the whole NP. The sections will be updated routinely as appropriate for the conditions in the NP or as additional information is found to incorporate into the section. The Paradise area is accessed through any one of three entrances, the Nisqually (southwest) entrance, the Ohanapecosh (southeast) entrance, and the White River (northeast) entrance. This means the conditions at Paradise, besides its own access and conditions, is dependent on the conditions through any of the three entrances, as noted below. Nisqually Entrance, is open to Paradise. The Paradise Valley Road and the Stevens Canyon Road closes with the first snowfall. The NPS has been repairing and repaving the highway between the Nisqually entrance and Paradise. This work is suspended for August and September to resume in October, so there will be altered traffic patterns in September but no delays. The delays will return in October until the end of the work for the season. White River Entrance, Highway 410 is open to Cayuse Pass and Chinook pass until closed for the season later in November. The White River entrance closes in October. The campground closes September 30. The road to Sunrise from White River campground closes in October. The Sunrise vistor facilities closes in September. Notes.-- All the trails will be snow-free through September and possibly through October when the seasonal snow begins in the mid-to-upper elevations in November. You should always check the NPS Website for the latest trail conditions. You should always be prepared with your gear, be flexible with your plans and have emergency equipment. For the Paradise area, at 5,2,00 feet elevation, expect fall mountain weather from cool and overcast with chances of occasional rain to warm and sunny during the day and cool to cold at night through October. Area.--The Paradise area is the most popular and visited area in Mt. Rainier NP with the Jackson Visitors Center, the Paradise Inn, and the Moutain Guide Center. With so many visitors, the NPS operates a shuttle service on Fridays and weekends from mid-June through the Labor Day weekend from Ashford (east of the Nisqually entrance) to Longmire and Paradise. The NPS enforces strict parking regulations on the limited parking at Paradise and on Paradise Valley Road. During the winter the road from Longmire to Paradise is controlled daily at a gate just east of Longmire. The road is checked and cleared every day before the gate is open to uphill traffic between 8-11 am. The road may be temporarily closed for periods during and after snowstorms until the road has been checked and cleared. Beginning in December 2012, the road is closed from Monday evening to Thursday morning. In addition, there are periods when the NPS requires 4-wheel drive and/or chains from the Nisqually bridge to Paradise. The NPS operates a check and chain-up area at the parking lot just west of the bridge. The NPS requires you at least carry chains during the winter periods for emergencies. The only camping facilities are the Cougar Rock Campground between Longmire and the Glacier Bridge on the highway to Paradise. No overnight camping is allowed in the NP outside designated campgrounds. This includes the parking lot at Paradise and on the Paradise Valley Road. You are encouraged to have reservations if you plan to stay at the campground or at Paradise Inn. The exception to the camping restrictions is during the winter months at Paradise where winter recreation rules apply, see NPS Web page. Please follow these rules to prevent damage to the ground and vegeations underneath the snow. The Paradise area has many trails for many short and longer day hikes within a 2-3 mile radius from Paradise or along the Paradise Valley Road. In additions short drives from Paradise provide many scenic stops, such as Narada Falls, Reflection Lake and Lake Louise, and overlooks at Ricksecker Point, Canyon Rim and Inspiration point. The numerous trails starting at Paradise, see map (PDF), and described below, range from short hikes of a mile or less roundtrip to views of Mt. Rainier, glaciers, meadows, rivers/creeks, and the surrouding mountains, to 3-5 mile day hikes, some with significant elevation gain to higher scenic overlooks and many landscape and nature features, including several glaciers and snowfields, the Nisqually and Paradise Rivers and river valleys, and magnificant views of Mt. Rainier and the surrounding mountains. It should be noted with the hikes, and really any dayhike in Mt. Rainier NP, you should always take a (day)pack with the ten essentials (PDF), especially food, drink, and clothes for cooler or rainy weather. You should always wear good hiking shoes or boots. Having tired or sore feet miles from the trailhead and car isn't fun. Access.--Due to the central location of Paradise, access to it is available from three of the four entrances and the highways to and in the NP, see travel overview and places. Maps.-- You can get a topo map of the Paradise area, or as a PDF (8 Mbytes), along with more maps from the map resources. Area.-- The Paradise area, in the south central part of the NP encompassing the south and southeast slope of Mt. 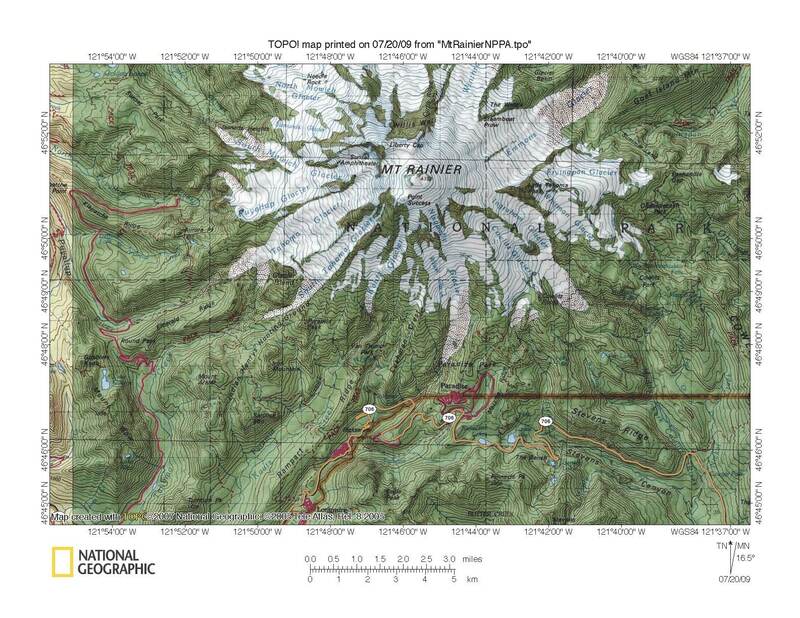 Rainier, is surrounded by the other four quadrants and their respective areas of the slopes of Mt. Rainier. For this guide the Paradise area is defined by the mid-to-upper elevations, above 4,000 feet, of Mt. Rainier, and is bounded on the south by the Tatoosh Range, the west by Rampart Ridge, and the east by the Stevens Creek valley. The area for this guide is bounded on the north by the upper limit of the trails at Paradise to the highest parts photographers and hiker normally go, beyond which is reserved for experienced hikers and climbers. The area includes the summit of Mt. Rainier, only because the Paradise area is the closest to and readily visible at Paradise, and because most summit climbs orginate from Paradise. Note.-- See qualification about inclusion of the summit of Mt. Rainier in the Paradise area. 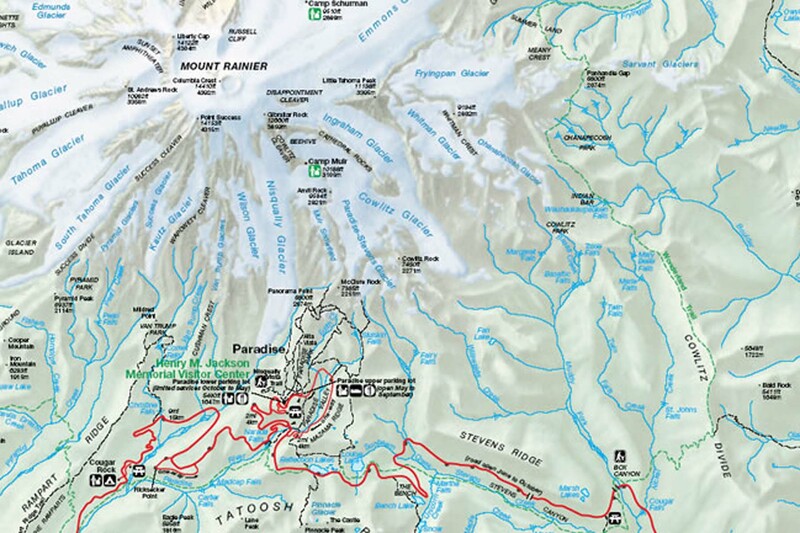 As noted (see qualification), the northern boundary for this guide is the upper limit of the trails from Paradise to the glaciers, rock formations and features, and the climbers camp for overnight summit climbs at Camp Muir, which is about 10,000 feet elevation. Within those boundaries, the Paradise area offers the many diverse landscape features in the NP, including the three prominent one. The first is the contination of the forest from the surrounding lower elevation forests. The second is the intermediate or transistion zones between 5,000 and 7,000 feet where the forest transistions into open treeless areas and meadows. The third is the upper elevation alpine areas, above treeline and meadows where persistent cold temperatures inhibits all but alpine vegetation and is mostly rocks, snow and glaciers. This includes the lower extent of several glaciers and snowfields above the Jackson Visitors Center at Paradise, see description of glaciers and map of locations for viewing glaciers. The Paradise area also includes the headwaters and upper basins of several rivers and many creeks, easily visible and visted by the trails at Paradise and on the Paradise valley road. In addition there are several lakes, Reflection Lake, the most photographed lake in the NP, and the many waterfalls in the NP, such as Narda Falls. And lastly, the area has the most visited wildflowers meadows. Notes.-- Many of the described photo location and opportunities are found on the map of the area. You can get a topo map of the southwest area, or as a PDF (8 Mbytes). You can learn about the geology of the NP from the geology guide along with a roadside guide for the highways approaching the NP and in the NP. Early (pre-NP) years.-- The Paradise area was long used by various tribes surrounding Mt. Rainier (Mount Tahoma) as a seasonal recreation destination and for the plentiful food sources (plants and animals) and supplies (medical, ceremonial, etc.) in the area. The first explorers were often guided to this area by their indian guides, and once discovered it became the destination location, first for mountain climbers and then recreationers. The ony problem was getting there as the route was a primitive trail at best with with Nisqually river crossing just below the terminus of the glacier. While Mt. Rainier was climbed serveral times before the 1880's, it was the 1880's when the Paradise area saw increasingly more climbers and visitors, but it wasn't until the early 1890's when travel was improved for wagons, and then again in the late 1900's when work was started on a road suitable for automobiles, first to the Nisqually River crossing and then to Narda Falls, in 1908 and 1909 respectively, and then to Paradise by 1915, a year before the NPS was created and assumed ownership and management of the NP. Up until Mt. Rainier NP was created from the Mt. Rainier Forest Reserve in 1897 the Paradise area was pretty much a seasonal tent city with primitive facilities and all food and supplies brought in by mules and horses. While it limited the number of visitors, it didn't diminish the damage to the area as open fields and meadows were cleared for camps and trees were harvested for timber and firewood. It's safe to say minimalist camping and environmental conservation wasn't a priority. Early NP years.-- The first decade of the new NP wasn't much different from the previous decade, in part because the trail and facilities didn't improve, and because Congress didn't include funds for the NP beyond a few people to be there. Doing anything wasn't in the plan and budget. This changed in the later half of the 1910's with plans for a road, completed to Paradise in 1915, and with the NPS created in 1916. It was the new agency who foresaw the potential of the area and contracted for the construction of the Paradise Inn in 1917 to start replacing the tents and the Mountain Guide Center a few years later to help climbers. The rest of the development in the Paradise area was then focused on trails. Much of this was prompted by the popularity of the area and the interest to get visitors into the immediate backcountry. In addition to these trails, the NPS then focused on two other issues. One was establishing climbing routes from Paradise with the 10,000 foot elevation overnight camp at Camp Muir. Another was establishing the Wonderland trail to circumnavigate the mountain and connect the areas together. The Wonderland trail provided the best visitor experience for the backcountry hiker, but it didn't and still doesn't, go through the Paradise area. The planners decided to separate the experience of the hikers from that of the visitors. The Wonderland trail was, and still is, connected to the Paradise area via the Paradise River trail immediately south of Paradise in the Paradise River valley east of the visitors center. Recent NP years.-- Pretty much what visitors see now in the Paradise area is what has been for the last few decades with one major exception and one minor one. The major one is the new Jackson Visitors Center which opened October 2008. The old visitors center, built in the late 1960's, was razed in the spring of 2009 for additional parking and open space. The minor exception is the two-year renovation of the Paradise Inn which opened in May 2008. Other than these changes the most recent change, initiated in 2008, is the shuttle service on Fridays and weekends from Ashford to Paradise with stops in between. This service, which runs from mid-June to just after the Labor Day holiday weekend, reduces the impact on the limited parking at Paradise and along the Paradise valley road. Area.-- There are a variety of trails in the Paradise area, almost all provide excellent and often expansive views of Mt. Rainier and the surrounding mountains along with many landscape features in and around the area, such as forests, glaciers, meadows, alpine areas, rivers and creeks, waterfalls, and lakes. Some trails will also provide views of the Cascade Mountain Range to the east. In short, something for every photographer. The trails are of three types. The first are the short, about a mile or so, to overlooks of Mt. Rainier and lanscape features. All of these have their trailheads at the Paradise parking lot from the Jackson Visitors Center or the Paradise Inn, with the rest with their trailhead along the Paradise Valley Road. The second are the normal day hikes, usually 3-5 miles, to farther locations or loop trails. These often have significant elevation gain, usually 500-1,000 feet, some more. These include Rampart Ridge, Paradise Glacier, Panorama Point and Skyline trail. These trails necessitate hiking with good basic hiking gear, such as the ten essentials (PDF), food, water, cool or rain weather clothes and good hiking shoes or boots, along with your photography gear. In addition, some of these trails connect to the Wonderland trail. The Wonderland trail bypasses the Paradise visitors area, following the Stevens Canyon Road to Inspiration Point and Narada Falls before following the Paradise River trail to Longmire. These trails from Paradise provide additional trails to hike to more photo locations and opportunities. The last type of trails originate outside the Paradise area, with their trailheads off highway 706, either from the Longmire to Paradise road or the Stevens Canyon Road. Along the former are trailheads to Van Trump Park and Mildred Point and the scramble from Glacier Bridge (over the Nisqually River) to the Nisqually Glacier or down the Nisqually River. Along the latter are the trailheads to Pinnacle Peak, Bench and Snow Lakes, the High Lakes Trail (between Reflection Lake and Lake Louise), and sections of the Wonderland trail. For hikers who want a better challenge, the Paradise area has trailheads to the higher elevations used by mountain climbers to Camp Muir, or to higher elevations to and on the glaciers and snowfields and rock outcrops, such as McClure Rock and Cowlitz Rocks. A note about these hikes. You should always inquire at the Mountain Guide Center before starting on these hikes.. They will have the latest news on the trails and routes about the trails along with information on the rules, conditions, permits, guides, etc. about the locations and routes. A permit is not required for a day trip to Camp Muir, but the information will be very helpful. The goal is your personal safety. Resources.-- You can additional information on day hikes and locate them on a map of day hikes, and locate or download maps of the NP. You can also get information on the rules, permits, current conditions, etc. for backcountry hiking and camping along with information about the Wonderland Trail and climbing information. Notes.-- For the Paradise area, at 5,2,00 feet elevation, this means visitors will be encountering cold temperatures and snow as early as October, but usually not lasting more than a day or so until the seasonal snow in mid-late November. But you shouldn't encounter deep snow until into December and really into January. The trails will be almost snow-free below 5,-6,000 feet into October and intermittently in snow until the first seasonal snow, usually mid-November to mid-December. The snow level will drop from there to 3-4,000 feet by december. You should always check the NPS Website for the latest trail conditions through the winter as the weather and conditions can change quickly and severely overnight or during the day. You should always be prepared with your gear, be flexible with your plans and have emergency equipment. Photo Ops.-- The photo locations and opportunities in the Paradise area are diverse and plentiful. As noted, there's something for every photographer, plus a few more in the area. The problem for the photographer is to focus your location foron your interests and work with all the other photo locations and opportunities. Many excellent photo opportunities are just a short hike from the Jackson Visitors Center or Paradise Inn, see map of trails (PDF). This include Nisqually Vista, Avalanche Lilly, Morraine Park and Skyline (to Mrytle Falls) trails. For rivers, the Paradise River trail is excellent, but it's always deep in the forest valley below Paradise. If you're willing to hike farther, 3-5 miles, or to higher elevations, with ~1,000 feet and more elevation gain, there are numerous interconnected trails above the Jackson Visitors Center to panoramic vistas and diverse views of the landscapes, terrain and features, such as Glacier Vista, Panorama Point, Sluiskin Falls, High Lake, Rampart Ridge, and Paradise Glacier. For the more experienced or adventurous photographer-hiker, there are trails to the higher elevations alpine, glacier and snowfield areas above Paradise, such as McClure Rock, Cowlitz Rocks, and always Camp Muir. With these hikes, you should check with the Mountain Guide Center at Paradise. A permit isn't required for a day trip, but the information won't hurt. One of the best photo opportunities in the Paradise area are the waterfalls with several commonly photographed ones, such as Narada Falls, Mrytle Falls, and Christine Falls and the others on the Van Trump Park trail. The key with these are timing, meaning go early to avoid crowds, and consider the light, both daylight and the weather. In addition there are many more smaller, less photographed waterfalls which offer excellent photo opportunities and challenges. Another excellent photo opportunities at Paradise are the open areas, from the forest transistion zones to the wildflower meadows. It's what the Paradise area was and still is famous for, and it's all there on the many trails above the Jackson Visitors Center. The problem with wildflowers is that the season is usually short, 2-3 weeks from mid-July to mid-August, so as they say, timing is everything. You simply have to monitor the reports for the optimium time and places. The next photo opportunities are the alpine areas, the areas above treeline (~7,000 feet elevation) and the meadows, where three features rule, cold, snow and rocks. There are few route - no established trails, as noted above, to these areas, but they also offer excellent vistas of the whole areas on and around Mt. Rainier, from the Cascade Mountains east and south to the southwest-western hills, forests and lowlands. The last photo opportunity is the obvious, Mt. Rainier, "The Mountain" as it's locally known and called. There isn't a place in the Paradise area it's not visible, weather dependent of course - it's makes its own weather unique from the surrounding area, so the challenge is the same old adage in photography, it's about time and location. If you're staying at the Paradise Inn, it's easier to be ready and go, but you should spend time to explore the area and trails for the places you want to photograph later. Photo locations.-- Listed below and located on the Map of places offer a variety of places and locations in the four catagories listed. There are other photo opportunities listed in the different types of environment listed in the resources. Photo tips.-- Much of what is in the southwest photo guide, some of which is included in this section, applies to the Paradise area with addtional notes of photo locations and opportunities and photo tips for this area. Photo tips are hard due to the diversity of photographic interests and range of cameras. But for the most part, it's the old adage, it's about the light. This is one area in the NP where you can get some interesting photos any time of the day and almost any place you are, go or hike. The key is to be flexible for the range of light you'll get and the exposure you'll need, from deep inside forests to panoramic and scenic views of Mt. Rainier. With respect to light, once in the forest you'll see the whole range of light, from the direct sunlight penetrating to the forest floor to the darkest shadows under large trees. This can easily push the dynamic range of your camera, and where having a separate light meter or a camera with multiple metering modes, especially spot metering, is helpful. This is where using a tripod and bracketing shots also helps to capture the full range of light. With respect to the Paradise area this is especially true because there is the entire range of landscape features and terrain, from deep forests to open meadows and alpine environments. This provides the full range of light and exposures and the dynamic range of light with scenes. This includes the expanses of glaciers and snowfields, the deep shadows and dark colors of forest, and the sheer array of colors in meadows. The Paradise River valley, see trail notes, offers the higher elevation forest, transistion zones, and the Paradise river, nestled deep in the glaciated river valley. The range of riverine photo locations and opportunities are endless, but you should exercise care off the established trail to reduce your impact. In short, it's already beautiful, don't mess it up. The whole area above Paradise offers the open areas, from forest to forest transistion zones, meadows, fields of low high elevation shrubs, wildflower meadows, alpine environment and rock and glacier environments. The challenge is not to be overwhelmed with the vastness and endless photo opportunities, but to find the photos you want for your style and interests. Again, here there is the issue of light and colors from the dynamic range of light through the day from both the sun and the weather, especially over and around Mt. Rainier which does as they say, make its own weather. Patience is the key here, as I learned last October, and sometimes you find the shot, set things up and just wait. Wait for the light, and hope it comes. While it's not always necessary, I would recommend having a tripod for many of the photos, especially for photos of small subjects such as flowers, plants, etc., where you'll need a good macro lens, a cable release or shutter control, and perhaps a small fill-in or macro flash. There are many opportunities for photos of flowers, plants, and other small and closeup subjects. With respect to the Paradise are, there are many open areas and meadows to photograph, some within a short hike from the Jackson Visitors Center and some longer day hikes. There are also many photo opportunities with open areas and/or meadows against the background of the larger landscape features and especially Mt. Rainier itself. For these, it's all about location and light. Just keep looking, but please confine your off-trail excursions to places it's permitted. The last photo tip is lenses. The Paradise area is the one area, like the Sunrise area, where wide angle lenses are at their best and often the best choice. It's only a matter of your personal perference of the range. And while I'm not an advocate for wide angle zoom lenses, they're often the optimium choice for hiking and photography, such as Canon's 16-35mm f2.8 or 17-40mm f4 lenses for full-frame camera. They offer easier methods to frame a scene within the full size of the image without moving. Personally I prefer a longer range wide angle focal length, starting at 35mm and up to normal lenses of 50mm, both which are equivalents for my 4x5 lenses. Beyond wide angle lenses, I tend to stay in the 85mm to 135mm range (exception is a 180mm macro lens) to most of my photos and which work well at the higher elevation open areas for me. Due to the proximity of Mt. Rainier and the high elevetion terrain and features, there is little use for longer focal length lenses unless your interest is wildlife, in which case a 300mm lens with 1.4 and 2.0 teleconverters are often the optimium setup. Although wildlife is plentiful in the NP, they almost all tend keep their distance from people. And above all, keep wildlife wild (PDF). Advisories.-- There isn't much I can say about advisories except pay attention to the NPS reports and the rangers. The backcountry rangers are the most experienced and helpful folks there. Ask, listen and heed their advise, and you won't go wrong. And keep up with the latest NPS information as you can. And above all, please follow the rules and your permit. The rules are there for everyone's safety and protection of the resources. And the permit is to minimize the impact of your trip on the NP and for others. Do not go on a glacier without experienced guide(s) and the proper equipment. There is one note about the wildflower meadows that is important. Resources.-- Don't forget to look at the wealth of books and Websites (using Google image search) by photographers who have images of Mt. Rainier and write down the locations of where the photographer took the image(s). Some will provide this information, but as I have found in my discussions with photographers, some won't. If you have questions about some photos, you can contact me with the the book or link and I'll do my best to determine where the image was taken. The Paradise area is my favorite place if I want diversity of landscape in Mt. Rainier NP. As said, there's something for every photographer, and it's all close within a 1-2 hours of hiking. And you have the facilities to stay, rest, or just hangout. The only problem is that you have to get there or along Paradise Valley Road early in the day during the summer season. That said, my favorite trail is the Rampart Ridge trail. It starts at the east end of the Paradise parking lot, traverse down into the Paradise Valley across the Paradise River, and then up to the Faraway Rocks, overlooking several lakes and the Cascade Mountains. The trail then proceeds north to the Stevens Van Trump trail and back to the Paradise area. This trail gives you the whole set of landscape features and variety of photo locations and oppoortunities. It's a good dayhike with few people until the end (Van Trump Memorial trail). On the busiest day at Paradise, I'll spend most of the day alone without seeing other hikers. That's hard to beat for a hiker and photographer. My other favorite trails are the ones outside the Paradise area, such as Van Trump and Mildred Point trail, Pinnacle Peak trail and the Bench and Snow Lakes trail. All of these, though, are very popular during the summer as the trailheads are just off highway 706. Resources.--Below are sources for additional information about Mt. Rainier and the NP.